Chen, J., Wagner, P. W., Tong, L., Boskovic, D., Zhang, W., Officer, D. L., Wallace, G. G. & Swiegers, G. F. (2013). 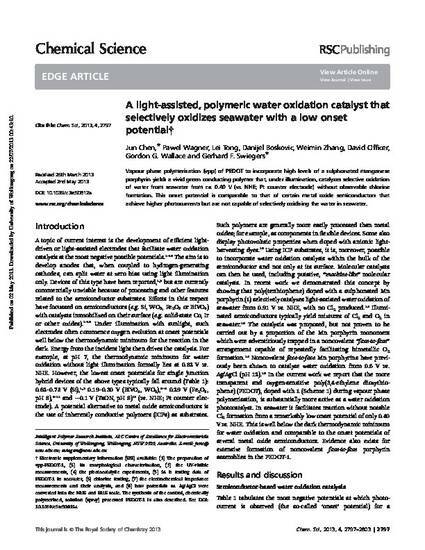 A light-assisted, polymeric water oxidation catalyst that selectively oxidizes seawater with a low onset potential. Chemical Science, 4 (7), 2797-2803. Vapour phase polymerisation (vpp) of PEDOT to incorporate high levels of a sulphonated manganese porphyrin yields a vivid green conducting polymer that, under illumination, catalyzes selective oxidation of water from seawater from ca. 0.40 V (vs. NHE; Pt counter electrode) without observable chlorine formation. This onset potential is comparable to that of certain metal oxide semiconductors that achieve higher photocurrents but are not capable of selectively oxidising the water in seawater.